India will be raised, not with the power of the flesh, but with the power of the spirit; not with the flag of destruction, but with the flag of peace and love. For two thousand years the Western world has dominated mankind’s destiny. A period of great opportunity and great progress. Every century has seen yet one more development, one more milestone reached in man’s relentless journey towards mastery of the Universe. After this period, what do we see? People who live in relative comfort with numerous objects of enjoyment and large institutions who straddle the planet with their numerous and multifarious activities. But we also see, people living in the darkest parts of Africa, friendless and full of fear and tragedy. Centuries of life currents completely disrupted by new confusing ideas; old ideals broken without new ones installed. We see living in the deserts of the Middle East, great wealth being generated by the sale of oil, but also with that wealth, a land where centuries old values of humans – freedom, democracy, equality, respect for all humans – are daily questioned and thwarted in the name of religion, in the name of power, in the name of a narrow, ruling elite. We find, in much of Europe and America, most of the Western world, beneath the relative material comfort, men and women full of anxiety, fear and worry. This is the world that two thousand years of human ‘progress’ has created. And in this world India must find its place, its role. What is India now? A confused giant, slowly awakening from the slumber of centuries. Its middle class has just discovered material comfort and is reveling in it. Its poorer classes are being forced by the demands of a nation transitioning from government control to market realities, to seek opportunities in an environment no one, least of all, they, can understand. It is this India that must grow; change irrevocably; improve its ways and yet cling on to its age-old essence; it is this India that must find its place in the Universal Sun. To this India, Swamiji has a message. If you must rise, rise quickly, work swiftly, become effective, and learn to make your ideas stick. And to do so, work along the lines of least resistance. Do not try and learn the tricks of another race. Do not seek to imitate the ways of those who have lived differently from you, and understand the world differently from you. Instead be yourself, be yourself. And who is this India? This India, this inner India, is a land of tremendous faith, tremendous belief, tremendous feelings. 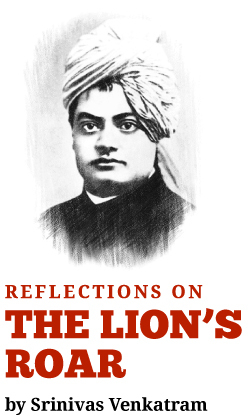 This inner India respects most of all, the ultimate end of life – the evolution of man to God. This India has always sought for itself peace instead of war, satisfaction instead of greed, gentleness instead of pride and anger. This India is within each one of us. To this India, lying dormant within all of us, each of us, Swamiji directs his attention. He says, show yourself to the world and become the locus of all activity. Expand this consciousness, heighten those feelings, strengthen those nerves, and show to the world a face that is quintessentially yours. This India, of love, purity, devotion, five thousand years of patience, centuries of gentle toleration and millions of faithful; this India must manifest itself to the world. For this is the line of least resistance and quickest action. This is the path that is uniquely ours. The path of love. The path of India.